Here’s a poster design that has been floating around my head and sketchbooks for about a year, so I decided to get it out and make it real. It was about time to realize this thing, so here it is. Signalnoise: Cycle. 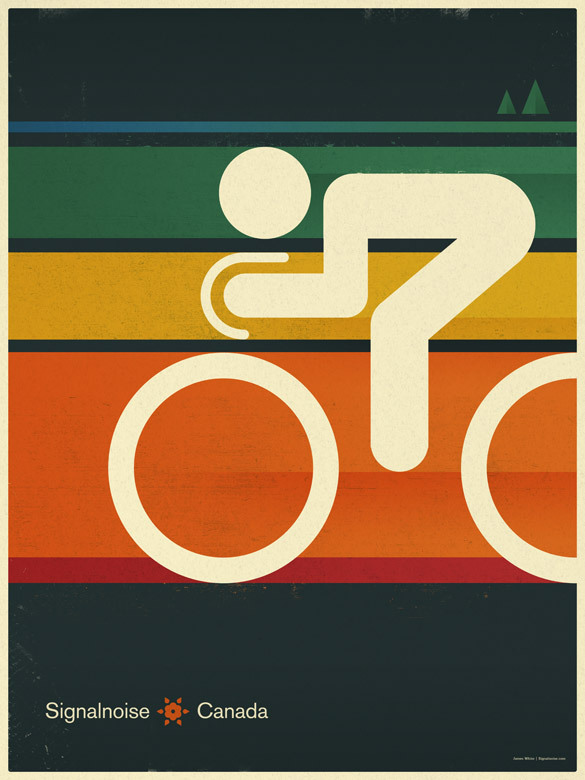 The reference of this design is obviously Olympic posters created back in the 1970s, mainly the 1972 Munich Olympic Games. All of that work was created by Otl Aicher. I wanted to create something more simple then my usual work, and show some restraint in the color palette and texturing. A challenge to say the least, since I’m used to running hog wild through Photoshop and flinging lights all over the place. This was a calmer process, I really enjoyed it. I’m going to print this up in the next few days after a bit of mild adjustments. Great artwork! It shows how versatile you can be. Congrats! Great work! This would look great as a Parks Canada sign for cycling trails. It’s always great to deviate from one’s normal routine and getting out of the comfort zone. Great poster! I like how the bars of color are separated by the cyclist’s different parts. This is really cool, I like how removed from your style it is, yet it holds true to your core designs. It would be interesting to see it in the more hog wild photoshop form just to see the translation. Love your work. Thanks for the kind words, gang. Yeah, this one is far more streamlined then my normal stuff. Made a conscious decision early on to not rely on effects or lights. Keep things really simple and pure. I particularly like shadow/gradient effects in the orange and green. Good work keeping it simple! I especially like the strength of the compositional diagonal from upper right to lower left. Cool colours and subtle textures. Yeah man, love it. It’s got a touch of Scott Hansen somewhere in there, must be the texture. Different, but still amazing! Great style!! while I do like the majority of your work, this one is really something special. the imagery is powerful enough to work on it’s own without a lot of dramatic lighting or other photoshop trickery. classic style, great use of colours. Woww…i like it… would love to see the whole series on this …if possible..
Minimalistic, yet signature James White with that “rainbow” in there. I also like these styles. Especially the simplicity of it. It’s funny you should post this. I was just thinking about something I might design related to bicycling while I was on my bike tonight. Look out for the Black Mountain Militia soon. No return. Straightforward graphics. That’s the power of design! One question, James: It will be printed on white paper or on “kraft color” paper? The poster looks simply amazing! We featured it on our blog: http://weandthecolor.com/post/5993637468/cycle-poster-by-signalnoise-more-inspiring with an impressive mass of reactions. So we hope we could send some extra traffic to your great work. are you having this print for sale? Love this picture, where can I buy it?? This is great! Where can I buy? Very good poster, incredibly beautiful.